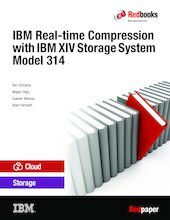 IBM® Real-time Compression™ is fully integrated in the IBM XIV® Storage System Gen3. Real-time Compression provides the possibility to store 2 - 5 times more data per XIV system, without additional hardware. This technology also expands the storage-replication-related bandwidth, and can significantly decrease the Total Cost of Ownership (TCO). Using compression for replication and for volume migration with IBM Hyper-Scale Mobility is faster and requires less bandwidth for the interlink connections between the XIV storage systems, because the data that is transferred through these links is already compressed. IBM Real-time Compression uses patented IBM Random Access Compression Engine (RACE) technology, achieving field-proven compression ratios and performance with compressible data. This edition applies to the IBM XIV Storage Software V11.6.1 with the IBM XIV Storage System Model 314. Model 314 features powerful hardware that enables a new high level for storage performance with compressed data.